After battling in 2012 to win funded Space Act Agreements from NASA for the latest phase of the agency’s Commercial Crew program, called Commercial Crew Integrated Capability (CCiCap), three companies spent 2013 working to make progress on those agreements. According to a mid-December newsletter issued by NASA’s Commercial Spaceflight Development Division, Boeing had completed 14 of 20 milestones on its CCiCap award, Sierra Nevada 6 of 12, and SpaceX 11 of 17. Those milestones were principally design and safety reviews, although recent Boeing milestones did include some engineering subsystem tests. The biggest test related to commercial crew efforts was actually Sierra Nevada’s final milestone in its older Commercial Crew Development Round 2 (CCDev-2) award. 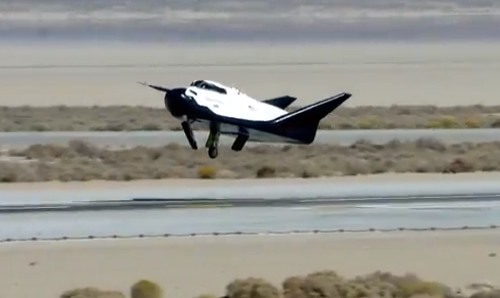 On October 26, the company performed the first free flight test of the engineering test article of its Dream Chaser lifting body vehicle, releasing it from a helicopter at an altitude of 3,800 meters (12,500 feet) to glide to a runway landing at Edwards Air Force Base in California. The glide and approach to landing went well, but one of the vehicle’s landing gears failed to deploy, causing the vehicle to skid off the runway after landing. Despite the landing failure, company officials considered the flight a success, noting that the vehicle performed as expected during the descent and approach phases of the flight. NASA agreed, declaring in December that the milestone was complete and awarding $8 million, the value of that final CCDev-2 milestone, to the company. However, some elements of the flight are still shrouded in secrecy: neither Sierra Nevada nor NASA have released photos or video of the landing incident, and a Sierra Nevada spokesperson said last month they have no plans to do so. As the companies continue work on their CCiCap awards, they’re also focused on developing proposals for the next phase of the program, Commercial Crew Transportation Capability, or CCtCap. In November NASA released the request for proposals for CCtCap, with proposals due on January 24. Unlike previous phases, NASA will award one or more contracts, not Space Act Agreements, under CCtCap to cover the design, development, test, evaluation, and certification of commercial crew vehicles. NASA expects to make contract awards some time this summer. One area of concern for the industry is just how many contracts NASA will issue for CCtCap. Agency officials have made it clear that they want to award at least two contracts in order to maintain competition and provide insurance should one company suffer delays. However, some in Congress have pressed NASA to “downselect” to a single company as soon as possible to save money. Whether NASA will be able to afford carrying more than one company through CCtCap will depend in large part in how much the program gets in fiscal year 2014, a budget that should be finalized later this month. NASA’s commercial crew efforts also suffered an unusual setback in 2013. In October, Ed Mango stepped down as manager of the program for, at the time, unspecified reasons. In December, those reasons became clear: he pled guilty to a felony charge after lobbying fellow NASA officials to reduce potential discipline against an unnamed colleague after loaning that person money, a conflict of interest under federal law. NASA has not yet named a permanent replacement for Mango; Kathy Lueders, deputy program manager, is currently serving as interim manager.